A side stream of wash or spray water flows through chlorinator. 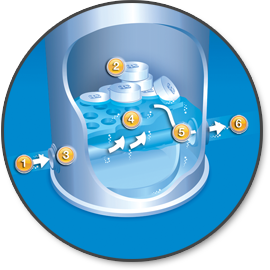 Accu-Tab® three-inch tablets sit on top of a sieve plate inside chlorinator. A control valve (available in manual or automatic) at the inlet allows for precise chlorine delivery. Untreated water rises through the holes in the sieve plate and erodes the bottom of the tablets at a predictable rate. Water is returned to the system with the appropriate amount of chlorine. The chlorinated side stream water meets main water flow where the two mix into a concentrated chlorine solution that can be pumped back into the original mainline and continues to the flume and/or spray bar. The chlorinator automatically stops when water flow is shut off. When the system is not in use, excess water drains off the tablets and into the solution tank to prevent premature dissolving.